For the first Young Chefs lesson of the term, we decided to explore one of the most loved and most consumed foods in our diets- pasta. Not only is pasta delicious, but it’s also incredibly versatile and lends itself well to culinary creativity. For this lesson, we did not follow a lesson plan that dealt specifically with the scientific component of the cooking. 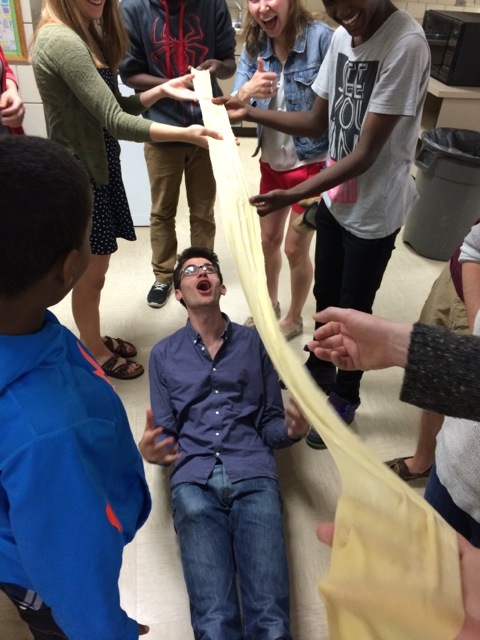 Rather, using the myriad of pasta possibilities available, we explored the wealth of possibility in food and cooking. With the beginning of the term, there was some confusion about the program participants, and the group ended up being very small— only three students. Though we had planned for more students, this gave us a unique opportunity to really get to know the students that we were working with and ensured that they each had a large amount of responsibility for the cooking. Though we were initially slightly disappointed with the turn-out, this was really the only hitch in the plan and it ended up being a fun break from the typical larger group setting. Before we arrived, we had prepared a standard batch of pasta dough to ensure that we had enough time to make toppings and roll and cut the pasta. First, we fed small chunks of pasta dough into the pasta machine and cranked each through multiple times to gradually flatten and stretch the dough out. As the boys enthusiastically cranked the dough through, they marveled at the long sheets as they emerged from the machine. As they were working their biceps cranking sheet after sheet of dough through the machine, they speculated about the composition of the dough and asked about the role of carbohydrates and different grains that they noticed were mentioned on the flour bag. Once the sheets were rolled out and had dried for a couple of minutes, we began the ultimate test of pasta prowess— feeding the long sheets through the pasta cutting attachments without breaking the noodles as they came out. 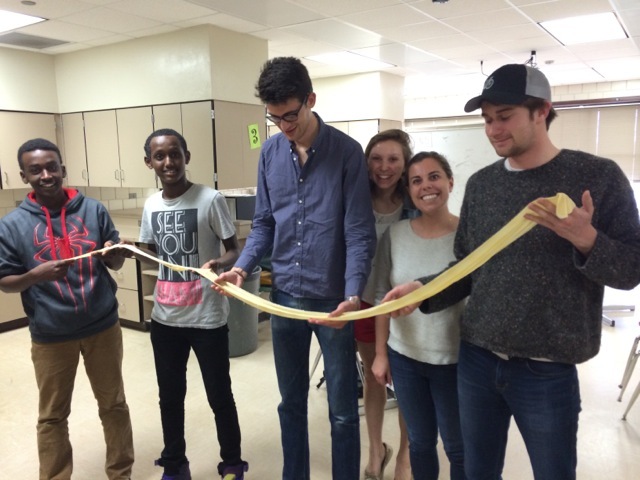 It turned out that they were pasta masters and had no problem cutting noodles, even if they were well over six feet long! As the noodle formation was underway, a group of volunteers sautéed some mushrooms, garlic and spinach which would be used for our next type of pasta— ravioli. To make the ravioli, we used wanton wrappers which we filled with combinations of ricotta, mushrooms, spinach, mozzarella and goat cheese. 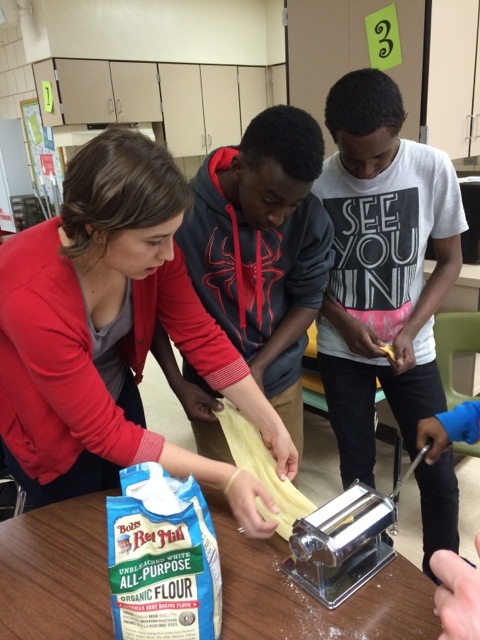 As we filled the ravioli, we stressed the value of creativity and ingenuity in cooking. Eventually, we had created dozens and dozens of ravioli and significant heaps of fettuccine and spaghetti. Once they were cooked, we tossed the plain noodles with brown butter, served the ravioli plain, and dug into our delicious pasta feast. 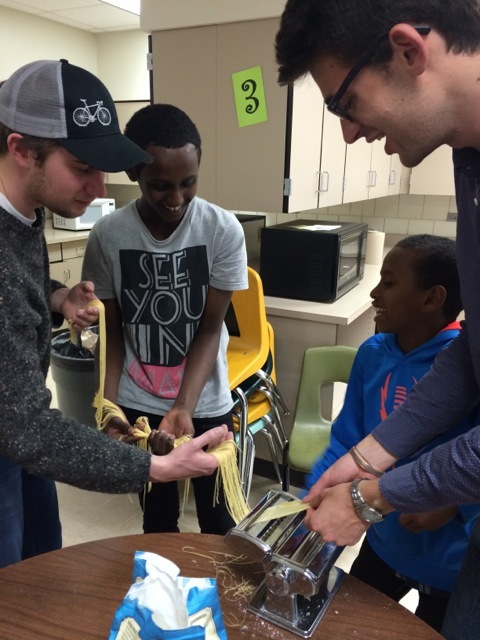 From rolling out the dough as fast as they could, to measuring the noodles against the tallest person in the room, to sampling the mystery-flavored raviolis, the boys were extremely engaged in and excited by the lesson and we deemed it a resounding success. Over the course of the lesson, the pasta stayed true to its reputation— an easy, delicious and creative dish that everyone loves.